JACE Girls is a mentorship program providing young girls in grades 6 through 12 with resources, experiences and access to a network of influential leaders that empower them to become the best versions of themselves, cultivating the next generation of positive leaders. Attending Spring Valley Elementary, Spring Valley Middle School, Mount Miguel High School, and later San Diego State University, Jerica Williams is no stranger to the La Mesa-Spring Valley community. 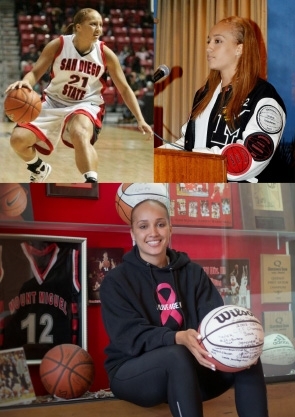 Falling into basketball when she was 10 years old, she has continued to use sports as a platform to serve and impact her community. Graduating from Mount Miguel High School with honors, earning a basketball scholarship to UCLA and later transferring to San Diego state, Jerica’s understands first-hand the influence of the neighborhood that has helped to mold and shape the woman she is today. President of JACE, Jerica is uniquely versed in sports and nonprofit industries from both the athletic and business perspectives. A former athlete and current entrepreneur, she is often referred to as professional connector, proven to bridge the gap between sports and non-profits. The philanthropist, Jerica founded Live4Gen in 2013 after former teammate and friend Genevieve Costello lost her battle to breast cancer at age 26. Every day spent with Gen filled Jerica with inspiration to attack life with all that she had. In honor of Gen and the impact she left, Live4Gen serves not only to assist in finding a cure for breast cancer, but also to ensure her legacy lives on. JACE girls directly reflects this mission by working to empower the next generation of leaders, all that Gen stood for.